President’s Choice is one of my favorite brands. They have so many great products that you forget that it’s a “store brand”. Every so often, they put out the Insider’s Report with all kinds of new products that they’ve released. Many times they are full of decadent treats that I love to try but won’t eat very often. Not this Insider’s Report! PC’s Blue Menu focusses on healthy living products including those with lower salt, omega 3, lower fat, organic ingredients, etc. Exactly what I’m looking for! 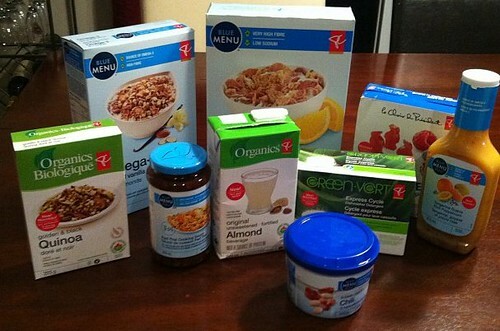 The first products I used were the organic almond milk and the organic golden and black quinoa. The night I opened the PC products, we had run out of milk. Yay for almond milk! I have tried soy milk in the past and I found the almond milk had a milder taste. I used it in my cereal and in my green smoothies in the morning. I like the taste of the almond milk and I could definitely see myself buying it. Dewey, however, hated it. I wasn’t overly surprised, though because he doesn’t like soy milk either. He is a “real milk” purist for sure. The organic golden & black quinoa is a great product. We really like quinoa and I liked how this was a bit different since it had two types of quinoa mixed together. Next time I won’t use the entire box because it made a LOT. See below for the recipe I came up with when I made it. I can’t wait to try all the rest of the products! Some of the products I’m most excited to try are the Honey Greek Yogurt Smoothie popsicles, the Wild Keta Salmon Cakes, and the Blue Menu Naan flatbread. One other thing that President’s Choice brings to you? To mark Nutrition Month, on March 3, a nation-wide ‘dietitian day’ will take place at Loblaw banner stores across Canada. In Calgary, there will be dietitians available at the Signal Hill, Huntington Hills and Deerfoot Meadows Real Canadian Superstore locations on this Saturday, March 3 to offer one-on-one consultations and guided grocery tours on different topics such as diabetes, heart health, gluten-free diets and family nutrition. This exciting event is part of an official sponsorship of Dietitians of Canada’s Nutrition Month campaign. As part of a livelifewell™ corporate commitment to helping Canadians make healthier choices, dietitians will be there from 10AM to 2PM to debunk nutrition myths and provide tips on how to make healthier food choices for customers’ individual needs. In a medium sauce pan bring water to a boil. Add bouillon, quinoa, bell pepper and mushrooms and stir. Reduce heat to low and simmer, covered, for 12-15 minutes. Disclosure: I received President’s Choice blue menu items to try. I was not paid for this review and all opinions are my own. Are you trying to eat healthier? What are some of the changes you have made to you and your families diet? Yum, didn’t know Quinoa came with 2 different colours. I have a Quinoa cookbook but have only made one recipe. Will have to try it! I haven’t heard about Quinoa before.. But this looks so yummy. I might as well try this recipe. Thanks for sharing.. I don’t know where the Quinoa would be located…near the bulgar? The smoothie popsicles are amazing. I bought the orange cream variety this week. we love quinoa in our house, it’s so good and easy to make. I wish my husband would eat mushrooms – it would be such an awesome combo with quinoa! !